Inventory We are a resale marketplace, not a box office or venue. Ticket prices may exceed face value. This site is not owned by Aragon Ballroom . The Aragon Ballroom has a long illustrious history in the city of Chicago opening back in 1926 and used continuously throughout the years to provide local residents and visitors a variety of intimate setting entertainment. The Aragon Ballroom box office is located at 1106 West Lawrence Ave in Chicago, IL. The theater is now owned by Live Nation and has a standing capacity of 5,000. Aragon Ballroom tickets have included acts like Green Day, Nirvana, Primus, the White Stripes and many more. The Aragon Ballroom was recently featured in the Batman v Superman: Dawn of Justice. 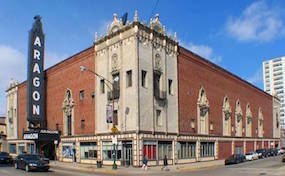 Ballroom-Chicago.com is an independently owned and operated site that is not affiliated with any primary box office, venue, and or website. Tickets may be well above or below face value and prices may change quickly with demand. To order tickets for all Aragon Ballroom Chicago events please call our operators at your earliest convenience or follow the process online through the checkou.